The crime scene along Norman Manley Boulevard in Negril where jerk vendor Wayne Sweetland was robbed and shot dead. Two other persons were injured in the attack. 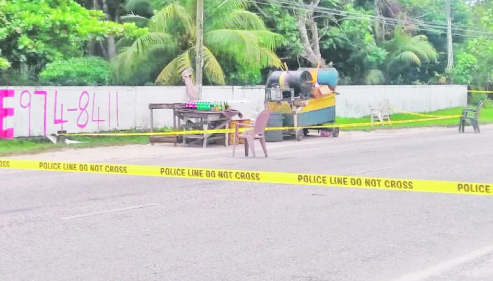 The parish of Westmoreland has now claimed the title of the murder capital of the West, as murders continue unabated there with rampaging gunmen claiming the lives of four persons, including a 16-year-old student, over a 7-hour period on Monday. Four men were also shot and wounded. The murder tally in the parish is now reported at 104 since Monday. The deceased have been identified as 16-year-old Manning’s School student, Shamar Tomlinson of Crowder District, Grange Hill; 20-year-old Davian Malcolm of Ricketts Street, Savanna-la-Mar; 32-year-old Renaldo Reid, otherwise called ‘Boom’ of Coolie Town, Fort Williams and 42-year-old Wayne Sweetland, a jerk vendor of Norman Manley Boulevard, Negril. Reports indicate that the murderous rampage began in the early hours of Monday morning when about 2:30 a.m., Reid was at home when the door to his house was kicked in by armed men. It is alleged that the men demanded money and when their demands were not met, they took Reid outside and shot him several times. The men also robbed his female companion of cell phones and a quantity of cash. Reid, who received multiple gunshot wounds, was subsequently taken to hospital where he was pronounced dead. A mere ten minutes later, Tomlinson was sleeping inside the family house at Crowder District, when unknown assailants reportedly kicked off the door, entered and opened gunfire at him. He reportedly ran from the house and was chased and shot several times to his upper body. The police were alerted and came to the scene where they found Shamar’s motionless body with a gunshot wound to the head lying face down on the ground in his yard. The lawmen were kept busy throughout the morning as over in the resort town of Negril about 4:28 a.m., Sweetland, who had just packed up his stall, was standing along the Norman Manley Boulevard with other persons when it is alleged that armed men on a motorcycle drove up and proceeded to rob them. Some persons ran and explosions were heard. On arrival of the Police, Sweetland and two other persons were seen with gunshot wounds. They were taken to hospital where Sweetland was pronounced dead. The fourth murder was committed later in the evening as reports from the Savanna-la-Mar Police are that about 8:30 p.m., Malcolm and two other men were standing at a shop along Ricketts Street when it is alleged that a motorcar drove up, from which two men alighted with guns and opened fire at them. The Police were alerted and on their arrival, Malcolm along with the two other persons were seen with gunshot wounds. They were taken to hospital where Malcolm was pronounced dead and the others admitted. Initial reports are that Shamar’s mother, upon hearing of her son’s death, fainted and was rushed to the Savanna-la-Mar Hospital for treatment. Principal of Manning’s School, Steve Gordon, says the school is still in a state of shock and mourning and they are slowly trying to come to terms with what could have caused the gruesome death of a very promising, well-loved student. Mr. Gordon described Shamar as a quiet, jovial student who did average work but showed the potential to achieve. “He had the ability to create good rapport and camaraderie among his classmates and other students. He was a compassionate student, as was attested by a fourth former who broke down when he heard of his death as Shamar was one of those who visited him when he was ill in hospital,” Mr. Gordon concluded.